We used a version of this Paperless Post card to announce our pregnancy to family and friends last week. 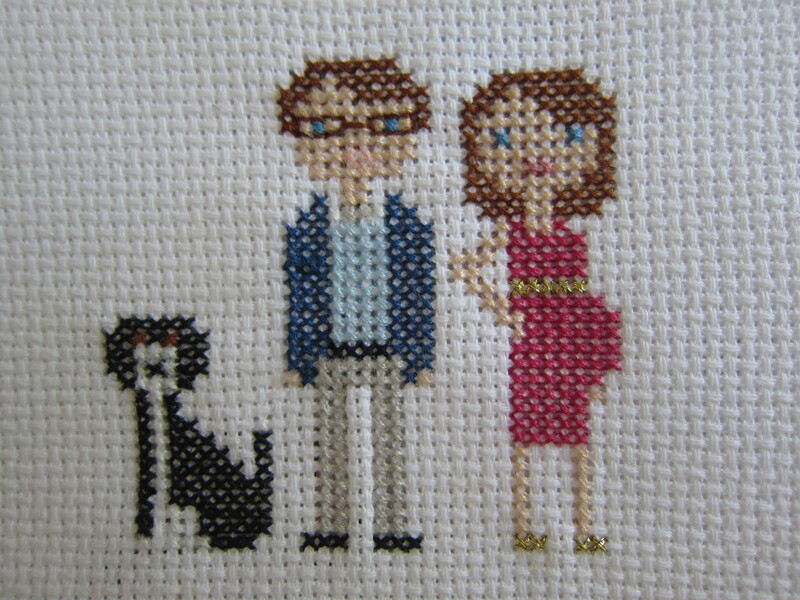 A few friends and family members responded with questions like, “is that picture a graphic?” and “did you make that cross stitch?” so I thought I’d share a little more about that family portrait. Cotton is the traditional second anniversary gift and I knew whatever I gave Sean would involve cotton. I don’t remember exactly how, but one Google search must have led to another and I came across instructions for Martha Stewart’s cross-stitch family and immediately knew this was the gift. Martha has a PDF of clip art templates that I scanned for inspiration. She recommends building your pattern on graph paper, but who wants to buy a whole pad of graph paper for one small project? I built out my design in Excel. 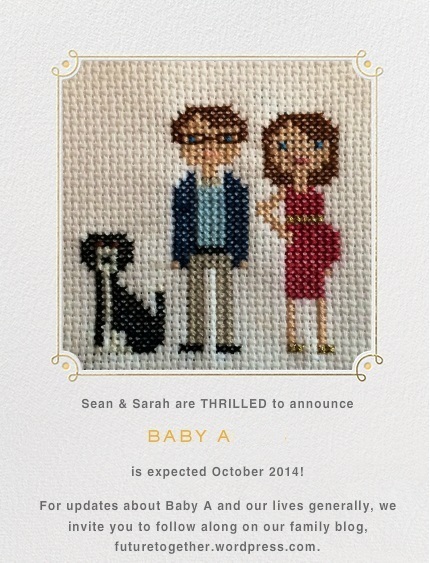 Excel worked well for me because Martha’s templates don’t include a pregnant lady, and there aren’t many Martha-inspired pregnant cross stitched ladies out there (at least not that I could find). I had to play with widths and spacing to figure out how to make that bump and bent arm work. It also allowed me to play with the colors. Initially, I put myself in a lavender dress. I can’t explain that to you. I don’t own a single piece of lavender anything so why I thought putting myself in lavender made sense is beyond me. 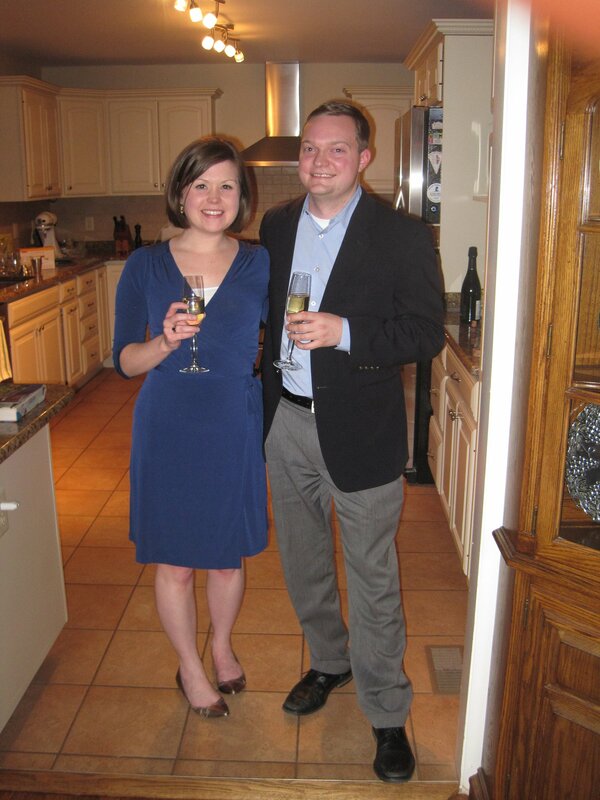 To keep with the wedding/anniversary theme, I used this picture from the night Sean proposed as inspiration instead. Sean’s outfit is the same and I changed my dress color to pink to match our wedding colors of navy and pink. Martha’s dog templates just don’t capture Aiden at all. I was happy to find the image below through Google and made it look as close to Aiden as I could. It wasn’t until just a few days before I gave this anniversary gift to Sean that I decided this would be the image for our announcement. I’m happy it worked out so well for both occasions. 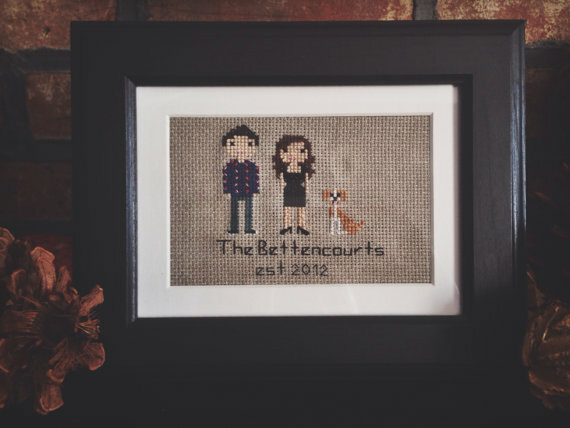 So all of this is a long way to say, if you’d like to create a cross stitch family portrait of your own and you’re comfortable with cross stitching, use Martha as your base, Google for inspiration, and adjust your design accordingly. Or, go to Etsy and you’ll find lots of crafters who will do it for you. Better yet, contact me and I’ll help you put your design together! 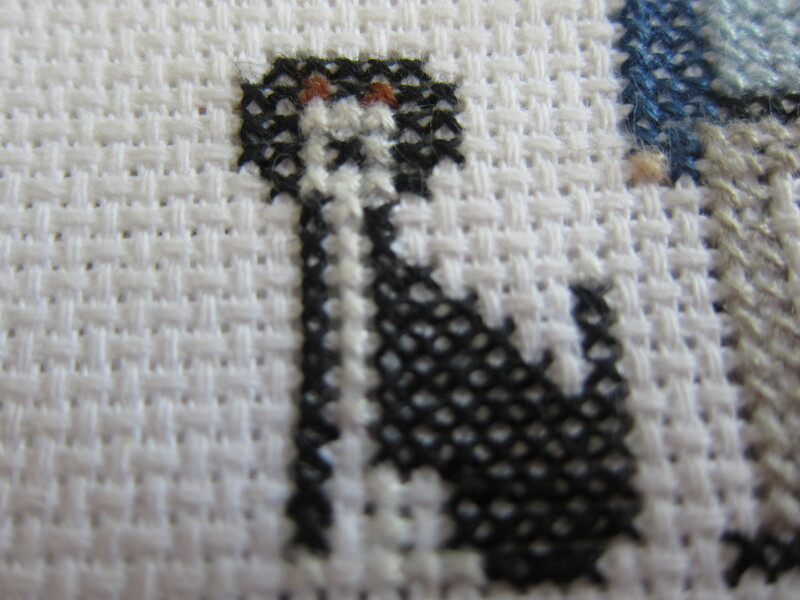 I’ll even stitch it for you. I think I’ve got one friend in line already! This entry was posted in Baby A, celebrations, crafts & projects by Sarah. Bookmark the permalink.